Come celebrate the end of the semester on a high note! There are TWO African Community-Style Celebrations coming up. Be our guest! Studio W150 (Irey Theater) is in the Theater building on the southwest corner of Norlin Quad. To get to the studio, use the doors on the northwest or southwest side fo the building. You should hear drumming right on the first floor! The African Dance final is a giant participatory African dance event (with live drumming), where everyone gets to join in the dancing and enjoy a delicious African buffet! Do not doubt your dance skills. 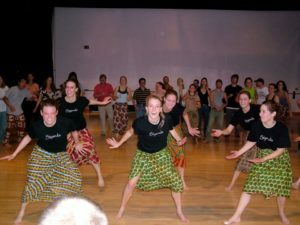 The dance party is immediately followed by an elaborate buffet of African dishes, prepared by students who spend four months perfecting their cooking. – Audience participation is a necessary part of the experience. Participate, even if it’s just clapping and cheering. – Bring a water bottle, some loose clothes to dance/sweat in, and bring your smile! Invite all your friends and family because the more people there are the more fun it is.